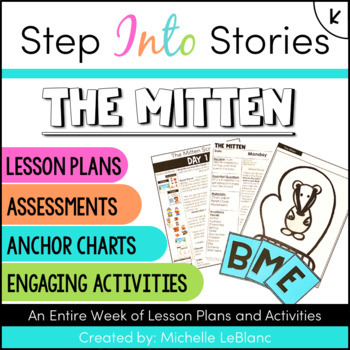 Anchor Charts- multiple charts to use throughout the week. There are fun vibrant labels that are easy to cut and add to your chart. These include labels for characters, setting, BME retelling, problem and solution, as well as retell cards. Posters- There are vibrant posters to help understand tough concepts. These posters are great for ELL's as well as visual support for all students. Craftivity- This is a fun craft that can be printed on colored construction paper or on white paper for the students to color themselves. There is a writing worksheet that can be added to this craft to make it a writing craft. Retell cards- There is a color set of these to use during whole group instruction as well as a black and white version that the students can color, cut, and paste in order at their desk. Great option for independent practice. These fit perfectly on a LARGE piece of construction paper or a regular piece that is cut in half and stapled together. Worksheets- There are worksheets for each day that go along with the lesson and a recommendation on how to use them but they can be used anyway you want. I have some differentiated options to meet the needs of all our learners as well a a few extra for "fast finishers" in your class. Exit Tickets- This has multiple exit tickets to ensure you students are mastering important concepts. Vocabulary- 4 poster size vocabulary word cards that go along with the story, differentiated vocabulary worksheets and exit ticket. 5 Day Lesson Plans- This is just a recommendation of how all these pieces fit together neatly in a lesson plan but they can be used in any way that you see fit. These are also EDITABLE. Daily Scripted Lessons- There are optional daily scripted lessons for those that want more guidance on this read aloud. These scripts also include which resources go with each day. Directed Drawing- Fun little extra activity with visual instructions and paper for directed drawing. Assessment - optional comprehension assessment that is Kindergarten-Friendly with pictures.